Honouring Excellence, Passion and Consistency – Pearl Academy Excellence Awards 2018! 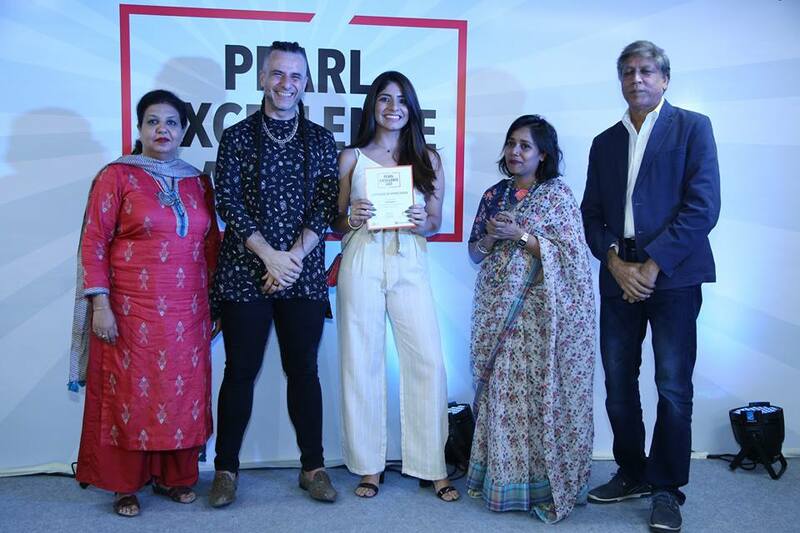 21st September 2018 students and faculty of Pearl Academy, New Delhi observed Pearl Academy Excellence Awards 2018, celebrated to acknowledge the students who portrayed excellence in various tasks bestowed upon them during their academic sessions. The air in the room was filled with pride, excitement and cheerfulness. Parents, friends and grandparents of the recipient’s applauded and cheered with great enthusiasm as their loved ones stood upon the stage, receiving the award with a huge smile adorning their faces. Their zeal, sleepless nights and endless hours of work were finally given recognition. At Pearl Academy, the academic excellence awards are celebrated with great cheer and joy since it’s an institution that acknowledges passion and does not base its academic structure upon extensive rote learning. “Excellence and Passion go hand in hand. Receiving an excellence award doesn’t signify that one is better than the rest, rather signifies that one is more passionate than his/her peers, which led them to achieve excellence in their arena. When you do what you’re passionate about, excellence comes naturally,” said Antonio Maurizio Grioli, Head, School of Fashion, Pearl Academy. It has been an even more joyous occasion since fashion business courses have been integrated within the School of Fashion, this way we get to celebrate more accomplishments than before, he further added. There was a farrago of emotion ranging from excitement, happiness, nervousness to nostalgia. Mayank, a student currently enrolled in the Interior and Spatial Design Undergraduate Programme said, “Passion was my driving force, not the award. While the hard work I put in was out of choice, to an extent it came naturally to me. Hence it felt great to be acknowledged for my passion.” When questioned upon the amount of hard work it takes to receive an award. Pride and happiness not only found its remnants amongst the recipients but also amongst their parents. Mrs Priya, Saisha’s mother, said. “Despite Saisha being an all-rounder throughout her academic life as a student, I feel differently about the excellence award she received at Pearl Academy. The educational system here requires critical thinking and hands-on learning as opposed to the traditional Indian education system.” Saisha is currently pursuing her Post Graduate in Fashion Business (Marketing and Merchandising) and believes that the liberal environment at Pearl nurtures individualism and creativity, the two factors that act as catalysts in achieving the epitome of excellence. It was interesting to observe the diversity of thoughts on ‘excellence,’ amongst those who were present. To one it was consistency, for the other it was perfection. The magnificence of the celebration did not lie in the fact that those acquainted to the institution performed well throughout an educational programme or during a particular semester, but in the fact that each recipient believed in their own idea of excellence. Though collectively they were being praised and celebrated by the institution, there was another celebration each one of them experienced inside of them, for that they are the ones who made the choice to prosper and excel. Here’s to raising a toast to their consistency, passion and hard work and courage. Click here to watch what our students and their parents had to say about the teachers at Pearl, our curriculum and their overall experience of ebing a Pearlite.